A major downtown in the current economy with many costs on the rise including materials and transportation is translating into a slumping building sector. Innovation in service offerings lowering developers cost is key. General Steel Corporation developed Design Services to offer a cost effective solution to create steel building designs. Our inexpensive Design Packages can be completed for 25-40% less than architectural firm costs and they can be completed in a fraction of the time. One of the hardest hit sectors of the economy is construction, that's why it's more important than ever to be innovative in helping developers build for less. General Steel Corporation recognized the need to offer a low-cost option to design Steel buildings and get zoning approvals. Gone are the days when the only option to design a project is by paying exorbitant amounts of money. 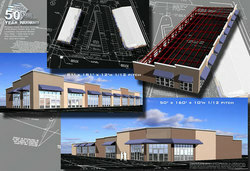 Design services was developed to create building designs which could be submitted to a zoning commission for approval. Design Services has become a very popular and cost effective method to design and engineer a construction project for General Steel customers. From initial conceptual design through detailed costing, planning and engineering, Design Services offer a low cost method to get initial approvals and fund raising. The first step in any building project is to determine the design and identify all cost factors. With this information the client can then make an educated decision on how to proceed with the building project. Design Services is geared to design projects with General Steel's premium quality pre-engineered and prefabricated steel building systems. Our commitment to our client's specific budgetary needs requires us to "value engineer" the projects with "lowest cost objectives" without compromising the quality. General Steel Design Services can offer the best value Design Package in the steel building industry. "Our inexpensive Design Packages can be completed for 25-40% less than architectural firm costs and they can be completed in a fraction of the time." Design Package pricing varies depending on the scope of work and take approximately 4-8 weeks for completion. These initial costs will typically be applied to the cost of the metal building package when ordered. General Steel design packages are prefect for communicating project plans to board members, bankers or city officials. These are a low cost way of beginning the fund raising process and seeking municipal approvals. Please call Design Services at 800-406-5126 ext. 4936 for more details or visit http://www.generalsteel.com.